Explanation: Bright sunlight glints and long dark shadows dramatize this image of the lunar surface taken by Apollo 11 astronaut Neil Armstrong, the first to walk on the Moon. 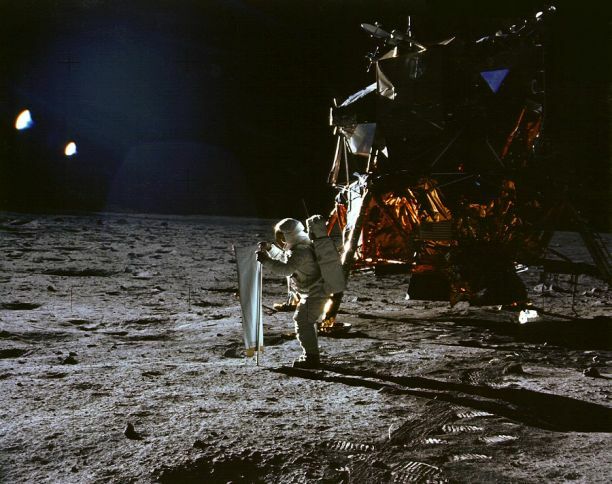 Pictured is the mission's lunar module, the Eagle, and spacesuited lunar module pilot Buzz Aldrin unfurling a long sheet of foil also known as the Solar Wind Collector. Exposed facing the Sun, the foil trapped atoms streaming outward in the solar wind, ultimately catching a sample of material from the Sun itself. Along with moon rocks and lunar soil samples, the solar wind collector was returned for analysis in earthbound laboratories.